Experience a breathtaking view from mount Meru. A car or bus will bring you to the entrance of the Arusha NP, here there is the possibility to walk through the Arusha National Park, and walk on mount Meru. The view is breathtaking, there are great views over the steppes of the Arusha NP, where you see the buffalos, zebras and giraffe grazing. On a clear day Mt. Kilimanjaro can be seen in the distance. 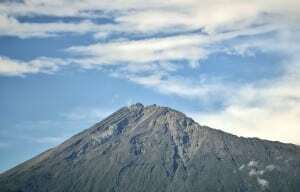 Where is Mount Meru and how big is it?